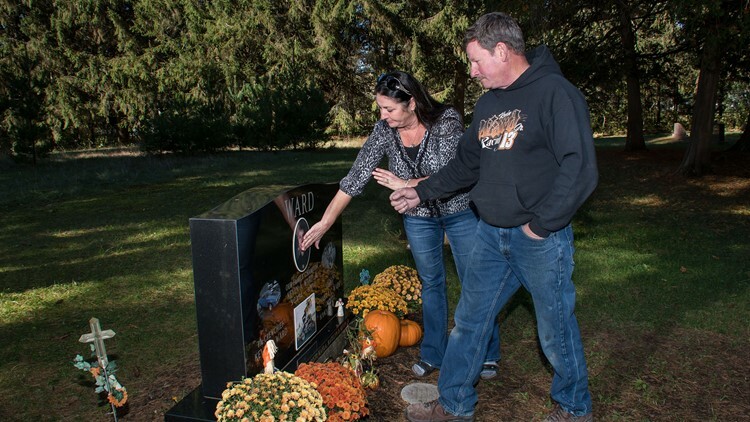 Pamela Ward and Kevin Ward Sr. visit the grave of son Kevin Ward Jr., located a few miles from their home in Port Leyden, N.Y. PORT LEYDEN, N.Y. — Tony Stewart left NASCAR's cockpit two years ago, but he continues to thrive in the environment he long has called home. He easily has exceeded those, just as he did during his 18-year stock car career that yielded three championships. His Monster Energy NASCAR Cup Series team is positioned to win another driver’s title at this Sunday’s season finale with close friend Kevin Harvick behind the wheel. And the 47-year-old continues to race and win on his beloved dirt tracks. The same kind of dirt track on which his car collided with and killed 20-year-old Kevin Ward Jr. in August 2014. The pain of losing their only son has been compounded by what the Wards believe is Stewart escaping any meaningful consequences for what he said was an accident, explaining that he accelerated through a turn in an effort to get away from Ward. Kevin and Pamela Ward are left with pictures and memories of son Kevin Ward Jr. and his beloved sprint car. Ward, who had exited his car after crashing into a wall after a maneuver from Stewart, walked down the track, apparently gesturing at Stewart as the field drove by under caution. Stewart's car appeared to fishtail to the right, Ward was clipped by the rear right wheel, dragged and thrown from beneath the wheel several dozen feet down the track. He suffered massive blunt force trauma. Drug tests later revealed Ward had marijuana in his system. A grand jury chose not to indict Stewart for manslaughter or negligent homicide weeks after Ward's death. The wrongful death lawsuit filed against Stewart by Pamela and her husband, Kevin Ward Sr., tentatively was settled for an undisclosed sum – despite misgivings by Ward Jr.’s family members – and became final in September. But those proceedings didn't bring the family closure. Stewart, through a representative, declined to provide comment on this story when reached by USA TODAY Sports. Reminders of their son are everywhere in the Wards’ home, where he was raised and lived before his death. Kevin Ward Jr. usually is pictured with his No. 13 race car – often alongside trophies. 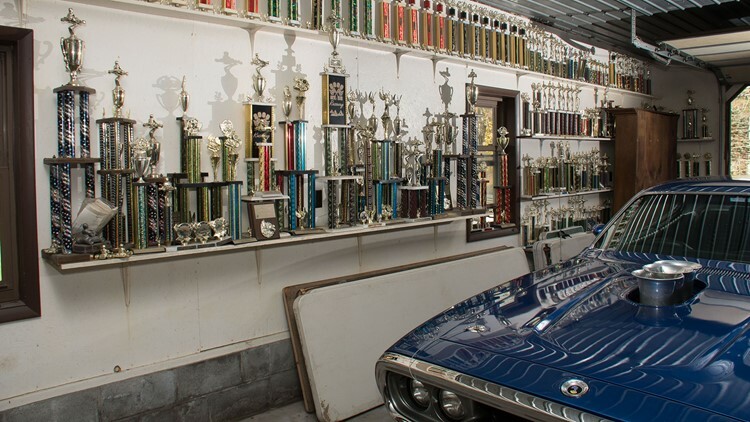 The photos hang in the living room and many of the 600 trophies he accumulated since his first go-kart race a few days before he turned 5 sit in a garage. Some of Kevin Ward Jr.'s trophies from his career, which began with a go-kart race before he was 5. Ward’s first exposure to racing came at four months old when one of his sisters put Ward on her lap and took him for a spin on a short track their father had constructed in the backyard. While NASCAR is the most popular form of racing in the U.S., Kevin Ward Jr. didn't dream of competing in stock cars. He had talked about racing in World of Outlaws, the nation's top sprint car series, but was content with racing on dirt tracks in the Northeast and Canada on the weekends, tinkering with his pickup and working at his father's industrial painting business. With the help of his father and some sponsors, Kevin Ward Jr. bought two sprint cars for about $120,000 in the spring of 2014, just months before he died. Racing isn't cheap and while Ward was successful, his father said it's not a lucrative endeavor at that level. 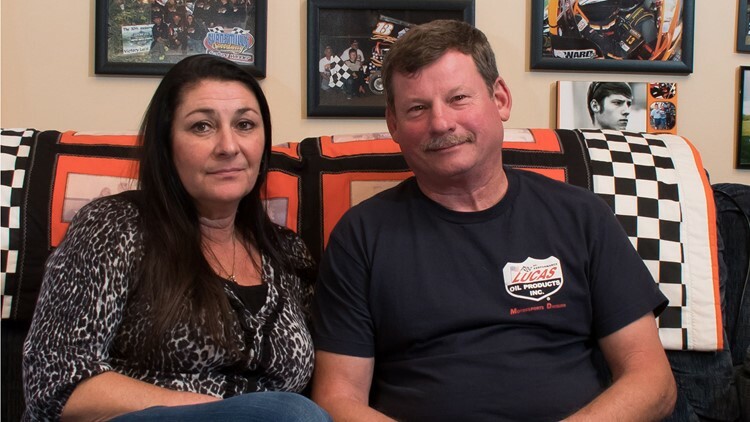 While some have questioned the family's motives for a civil suit, Kevin Ward Sr. said the family wasn't interested in ruining Stewart financially. Then-Ontario County District Attorney Michael Tantillo said the toxicology report on Ward “indicated at the time of operation, he was under the influence of marijuana." Experts hired by Wards’ lawyers disputed that Ward had anywhere near the level of marijuana in his system that would have caused him to be impaired, questioning the collection process along with how the levels of THC in his system postmortem were calculated. Tantillo said results of Ward's toxicology report were not presented to the grand jury, leading the Wards to speculate they were released to the news media to tarnish their son's reputation. Stewart’s car was not immediately impounded by investigators and was loaded on the truck with the right rear wheel that struck Ward already detached. No alcohol or drug test was administered on Stewart. Stewart, in a deposition in December 2016, denied that he steered toward Ward and added he didn't even know it was Ward who was approaching. He said he hit the throttle – which could be heard in the amateur video that circulated after the incident – "to try to drive the car down to the left to get away from him." "It was a split second from the time that I saw a person until I got to the person," Stewart said in the deposition. "... I attempted to change direction." Jessica Zemken-Friesen, a former girlfriend of Stewart’s who was competing in the same race at Canandaigua Motorsports Park, said Stewart turned the other direction, putting his car on a path toward Ward. In her deposition for the civil case, Zemken-Friesen said Stewart “tried to scare” Ward. "I disagree with that," Stewart said in the deposition when asked about Zemken-Friesen's version of events. 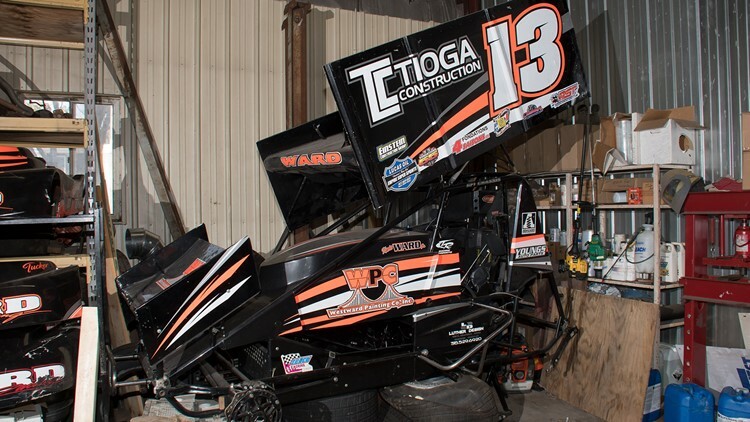 The race car driven by Kevin Ward Jr. on the night he was struck and killed in 2014 sits in his father's garage. Tantillo, who now works for the Yates County (N.Y.) District Attorney’s office, told USA TODAY Sports that he approached the case as he’s done each case in his nearly four decades as a prosecutor. Tantillo called the Wards before the decision by the grand jury was announced and said he “sympathizes” with the family. Kevin Ward Sr. remembers that call well. For a time, it appeared there could be another victim in all this: Ward Jr.'s on-again-off-again girlfriend told the family she was pregnant a month after their son died. The prospect a child would be left fatherless could have pushed damages into the $10 million-$20 million range, according to Lanier, the Ward family's attorney. . More importantly to Pamela Ward, she looked forward to what a baby would mean. There was just one problem: A paternity test taken after the boy was born showed that the child wasn’t Ward Jr.’s. “Everybody says that this was all about the money for us,” Pamela Ward said. “When we filed this case, we thought all the money was going to the baby. That’d be Kevin’s only heir. We weren’t entitled to any when we filed the civil suit. As Stewart seeks his second Cup title as co-owner of Harvick’s No. 4 Ford on Sunday, the Wards will be here, in this town of about 700 people, a couple miles from their son's grave site that features a colorful tombstone adorned with nods to Ward’s racing career. Seven-time NASCAR champion Jimmie Johnson and this generation’s most popular driver, Dale Earnhardt Jr., were among those who sent flowers to Ward’s funeral. Port Leyden is a landlocked village in northwestern New York, its name derived from its spot on a since-abandoned canal that ran nearby. The NASCAR finale will be contested about 1,500 miles south, just minutes from the Atlantic Ocean at Homestead-Miami Speedway in Florida. While Ward Jr. didn't have NASCAR aspirations, it's too soon to tell if the Wards' two grandsons – both age 6 – who race go-karts will have more of an affinity for stock cars.